MachFive provides cross-platform compatibility for the latest Mac and Windows operating systems. All instrument plug-in formats are supported - VST, AU, RTAS - as well as stand-alone capability. MachFive can open third party sample libraries directly - no time consuming conversion required. Seven 8GB DVDs contain 45 GB of instruments, FX, and loops. Sound Design tools include up to 128 samples per key, oscillators and organ generators, multi-point envelopes, tempo-synchronized LFOs, comprehensive effects (including a convolution reverb), rules based programming, and LoopLab for creation and manipulation of MIDI and audio loops. Scripted virtual instruments model not only the sounds of an instrument, in minute detail, but also the playing characteristics. For example, MachFive's included Telematic electric guitar instrument models strumming and picking techniques, which can be dialed up as desired. MachFive Biosphere presets include macro controls for quickly transforming the factory preset into unique creations. Xtreme FX is an 8 GB bonus sound library from UltimateSoundbank.com that puts 5,000 creative sound FX, foley effects, and provocative textures from car crashes to space storms. Universal Compatibility: MachFive is available in all major plug-in formats for Mac OS X and Windows, plus as a standalone application. 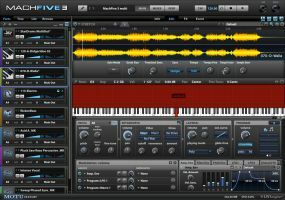 Universal Sound Management: MachFive effortlessly handles samples and synthesis, loops and instruments. Use the included 45 GB of sounds, or load third-party sounds natively without conversion. Unlimited parts mean you'll always have room for more, and with disk streaming you can manage them with ease. Synth Engine that incorporated twelve forms of synthesis and can be combined with MachFive's multi-sample instrument capabilities and extensive effects. Advanced editing that retains simplicity: With its simple one-window design, MachFive keeps everything in your reach, yet provides deep editing tools. Easily manage unlimited parts with unlimited keygroups and layers in a single window, using up to 256 MIDI channels and 200 discrete audio outputs (depends on host). Use the new expanded and full screen editors to attend to every detail. Loop Lab: Drag & drop import/export, beat slicing, MIDI mapping, time stretching, and advanced pitch shifting. Layers and Rules: Layers add a whole new dimension to your sounds. Organize, sort, and stack your sounds, and create dynamic performances using Layer Rules. Third-party multi-dimension formats like Gigasampler load with all of their rules. Mixer: MachFive's Mixer view provides the tools for a comprehensive mixdown environment. Quickly adjust levels, panning, audio outputs, MIDI inputs, add effects, and configure aux sends for multiple parts. FX: Use dozens of effects ranging from pristine convolution reverb to gritty distortion to multi-band processors, with hundreds of included presets or your own. Graphical control for plug-ins makes finding that perfect setting easy. Save up to four effects in a single preset with multi FX for quick recall. Advanced Sound Design: MachFive's sound design is powerful, yet intuitive and easy to use. Adjust all keygroups with one move, or create unique settings for every keygroup. Take advantage of filters, LFOs, AHDSR and multi-point envelopes, effects, and much more to carefully craft your sound. MIDI automation and modulation is available for nearly every parameter. Multi-point envelopes: Multi-point envelopes with unlimited breakpoints allow for highly customizable modulation. Sync your envelopes to your host tempo, and save & recall presets of favorite envelopes. Synthesis: MachFive seamlessly combines samples and synthesis in a unified environment. Use traditional oscillators (sine, saw, square, and more) or an advanced organ emulator. Surround: Edit multi-channel samples and loops and place your sounds in a surround environment from quad to 5.1 up to 7.1, for a truly immersive experience.